Erik decided he wanted to be a garbage can for Halloween. 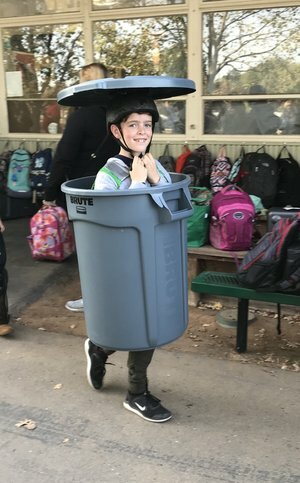 He doesn’t know who Oscar the Grouch is, he just decided a garbage can would be a great costume. He knew exactly how it should look and how he would pop-up and surprise people as he went trick-or-treating. Pedar cut the bottom of the garbage can out and added straps for his arms. He then glued an old bike helmet to the lid so he could wear it. He also taped a bag inside the garbage to place the treats. Erik LOVED his costume. It was heavy and he didn't visit as many houses as he usually would, but boy did he love making our neighbors laugh! I am grateful to Pedar for making his costume and working to make his Halloween vision a reality. Already looking forward to next years costume ideas!